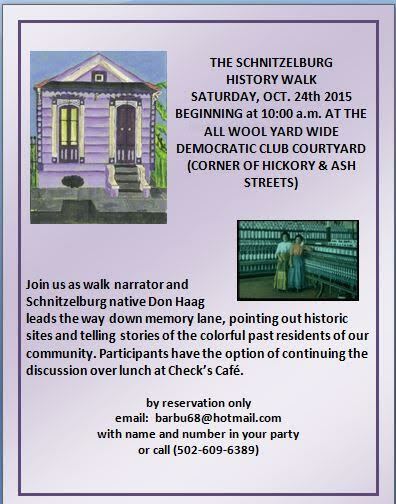 Join us on Saturday, October 24th at 10 am as walk narrator and former Schnitzelburg resident Don Haag gives a guided tour through the neighborhood and talks about the historical significance of local places and share personal childhood memories. Find out how Schnitzelburg got its name, the meaning of the expression “All Wool Yard Wide,” where the "gin" in cotton gin came from, the origin of the shotgun house, how high the 1937 flood waters rose in our community, and much more. Participants who grew up in the neighborhood are encouraged to share their memories. After the walk group members have the option of continuing the discussion over lunch at Check’s Café. An indoor slide show presentation and Q&A will be held in the event of rain (location TBD). We will meet in the courtyard of the All Wool Yard Wide Democratic Club at the corner of Ash and Hickory Streets. Coffee and doughnuts will be provided. Space is limited so make your reservation now! Call Steve at 609-6389 with name and number in your party or email barbu68@hotmail.com. If you get a voice mail please leave your name, the number of walkers in the party, and indicate if you will join us for lunch.